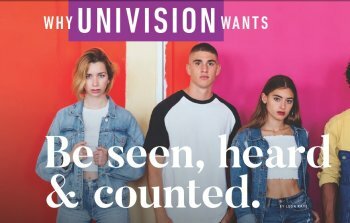 Univision – the leading media company serving Hispanic America with two broadcast networks, 11 cable networks and 15 mobile apps along with its television and radio stations – says it is doing all it can to use its position of trust to ensure Hispanic voices in communities around the country are seen, heard, and counted. According to the Spanish-language media giant, this campaign has two goals: Celebrate this country’s cultural, economic and social diversity, while giving a voice to citizens who want assurance that they will always be heard. Announced in May, the Rise Up: Be Seen, Be Heard, Be Counted campaign will use the strengths of mass media, from storytelling to gaming to digital technology, to boost the Hispanic community’s impact across the U.S. as part and parcel of Univision’s corporate responsibility efforts. BE SEEN is Univision’s directive to catalyze opportunities for the U.S. Hispanic community. Education is one pillar of this program; a drive to boost entrepreneurs is another. There is particular focus on families, including wellness programs to boost their health and that of the communities in which they live. BE HEARD offers a voice to the Hispanic community, in both English and Spanish, in the quest to diversify the U.S. media and technology sectors. Univision says it is offering financial support to academic programs coast to coast in a bid to develop more Latinix content creators and technology professionals. BE COUNTED focuses on the upcoming 2020 U.S. census. With federal representation and dollars at stake, Univision is pushing citizens to be sure they are not overlooked when it comes to the nation’s decennial population count. According to Stephen Keppel, vice president of social impact at Univision and the executive director of Univision Foundation, this campaign reflects a longstanding commitment to empowering communities so they have the tools they need to create a brighter future for themselves and their families. Be Seen, Be Heard, Be Counted not only represents the latest iteration of Univision’s mission to inform, empower, and entertain its audiences, but to stand with communities as they shape the future of the United States. At the heart of Be Seen, Be Heard, Be Counted is providing a platform and literally giving the mic to any voices that need to be amplified as they advocate for positive change. In order to allow these voices to be heard, Keppel explained how Univision is directing resources to help young Hispanics break into the media and technology sectors. For example, the company set up a technology center at its San Jose, California affiliate. Named the Univision Technology Center (UTEC), the state-of-the-art facility is designed to serve as a free educational space for the surrounding community. In addition, Univision has forged a number of partnerships that serve to train, mentor, and empower young journalists and media influencers. One such program at California State University, Fullerton organized a student video competition to showcase the work of young Latinix journalists, who explored topics including immigrant labor rights, juvenile justice, and violence against transgender immigrants. Giving young Latinixs the opportunity to amplify their voices ties in to a large component of Univision’s strategy: The dedication of resources and attention to the upcoming 2020 census. As part of its civic participation work, the company has already begun to raise awareness and encourage participation in the census, as eing counted is critical. Over 130 federal programs and almost $700 billion federal dollars in health, education, environment, workforce, and infrastructure investments will be at stake. But Univision believes it cannot push these necessary changes on its own, which is why it is asking for allies. “Our audience is part of the young and rising mainstream of America but still they are often not given the attention they deserve, whether it is by corporations or political parties,” explained Keppel.